marital bless: Not to be a debbie downer . . . I'm not sure how I can turn this post into an encouraging one. For the past two days, my mind has been occupied by death. Oh sure front load washers and manual Vue's are in there as well, but overwhelmingly I've been pondering a few what-if's. A college classmate, fellow student-athlete, and strong man of God died Sunday in a 2 vehicle crash, there were 8 passengers and a few still definitely need prayer. While I can't say that I was "friends" with Andy, or that he was influential to my college career, I knew him and could see God working through him. After graduating he became the Marshall E Free Youth Pastor and just came home from a weeklong missions trip in Mexico. That community is reeling right now. It's just such a tragedy, but as a friend put it, "God just couldn't wait to have him home." Andy, you will be missed by the many who's lives you touched. Please pray for the driver of the van he was a passenger of, as the van caused the accident and the 19 year old was treated and released for insignificant injuries. I'm sure she'll be living through a lot of grief and blame in the coming days and years. 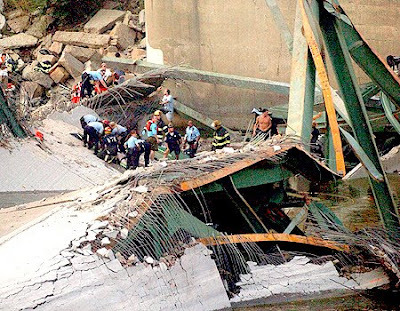 Additionally, a lot closer to home, as if it even needs to be, August 1st will mark the anniversary of the 35W bridge collapse. I chronicled my reaction to the event, here, in just my 2nd blog post last year. I know that I was barely even effected by this event, if anything, it causes a little hitch to my pschye, but as I sat down to read the StarTrib's anniversary article, allowing survivor's to recap their past year, I couldn't help but sob at the table. 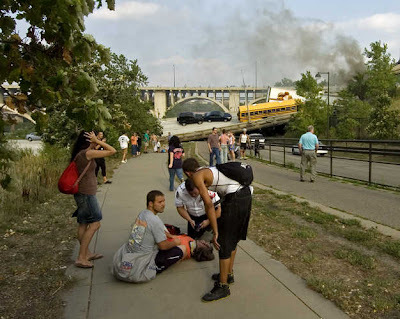 I'm not one to go into dramatics, and it was a so well travelled crossing, that almost the majority of minneapolis-st.paul and suburb dwellers could say "I crossed it just ____ before," but I was there, on that bridge. I missed it by less than 15 minutes. My husband very well could have been arranging a funeral on our 1 year anniversary. 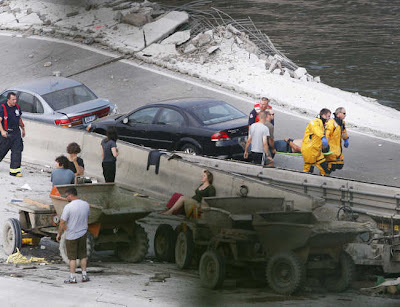 An almost one mile stretch, 75 vehicles, one school bus, one semi, 18 construction workers: 13 dead. The relief response was almost immediate. 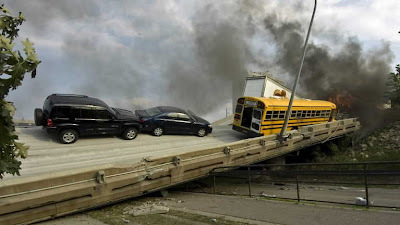 In one of the most remembered stories of the bridge collapse, the driver of the burning semi waved and honked for the passengers of the school bus, seconds before pulling ahead and his immediate death as his truck hit a section of the bridge that protruded. I'm sorry, I just couldn't turn these into encouraging. Just hug those close to you and be thankful for every second of this life that we live. Leah, I know the feeling. 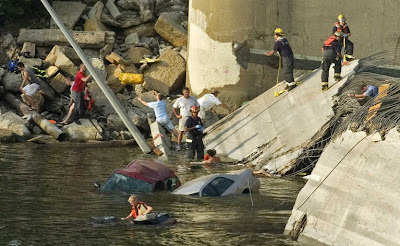 Whenever someone I know dies or there is a tragegy, my mind focuses and re-hashes death over and over and over again. It consumes me and I wish it didn't. As a Christian, I'm ashamed to admit that something about death scares me but I was relieved to hear a biblical counselor at church once say "I'm not afraid of being dead..I'm afraid of DYING." That's exactly how I feel. I also think about how I would handle losing a loved one suddenly. The Steven Curtis Chapman incident immediately comes to mind. I wonder if and how I would get through it. It's moments like these though that make me so thankful for what I have. I take in everything...Jim's presence, his voice, even his smell as weird as that is! But I know the gloomy feeling you are referring to. I get the same way. Hang in there...it will pass. We all have downer days and you are completely entitled to be honest on your blog. 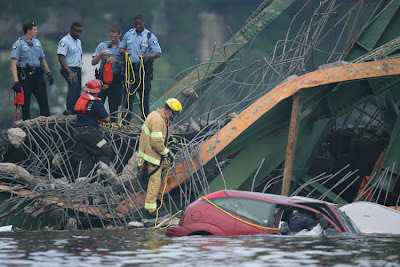 The bridge collapse was one of those surreal, reality hits you in the face things....I'm so glad you are okay! Hang in there. We all have days like this! I can't believe you went through something so terrible. I remember seeing it on the news when it happened, but I never thought I'd meet someone who had been there...what a small world. I will also be thinking about this young man who passed away. Sometimes when we hear of people dying, we forget that they lived lives, had families, and had memories. My sympathies and prayers! I also find myself pondering death from time to time - it amazes me how life can be taken so suddenly. It's depressing and often seems unfair, but I guess all we can do is rest on the knowledge that God has a plan and it's in His hands. It definitely puts things into perspective! I'm sorry to hear about your friend, no matter how close you were (or weren't) he was still part of your life and you know those close to him. Girl, you are not alone. 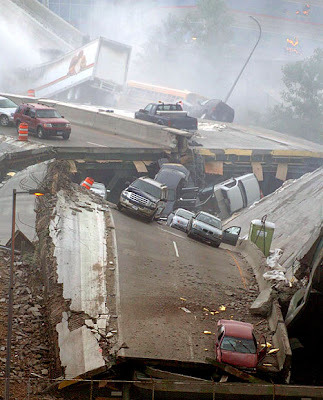 I always imagine the worst and lately I will have a near anxiety attack just driving down a busy interstate. I don't know if it's b/c the media seems to only report tragedies these days, but it's definitely made me realize that life is fragile. Ok, now that I have wiped away the tears I can type. I'm sorry about your friend/classmate Leah. It's never easy to hear about tragedies like these. Stay strong and keep you chin up. God has a plan. The bridge. I have no words. I can't believe the anniversary is here already. Our firm represents some of the survivors. It's tear jerking working on those cases to say the least. 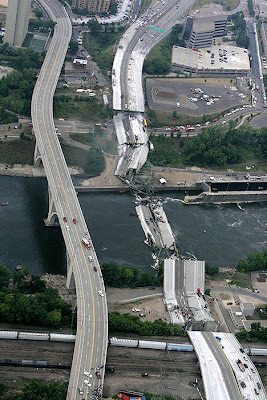 I think every Minnesotan can remember exactly what they were doing when it collapsed. Chris & I were driving home to Chi for my Gram's wake & funeral. Talk about emotional on all levels. 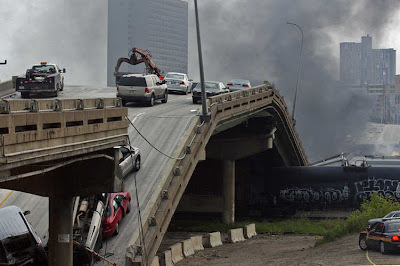 Like you, Chris was on that bridge earlier the day it collapsed. Thankfully you both are here, safe and very alive. I think this is another example of how Minnesota can be such a small world--my husband played basketball with Andy for a couple years when they were kids. Nobody should die so young, and especially not a person who seemed so selfless. Leah - I'm sorry you're having such a rough day. There are so many things that happen that we will never understand. 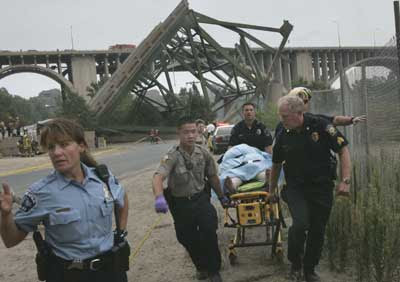 There isn't much I can say that will make you feel better today, but know that I'm thinking of you, Andy's family and everyone involved in the wreck, and the families who were affected by the bridge collapse. This post just broke my heart. 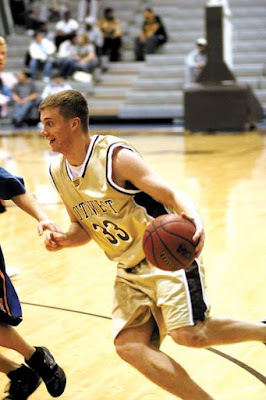 Andy and I are from the same hometown and he played basketball with my brother back in the day. We were shocked to hear God call this man home when he was a clear example of giving your life to Him. We are so saddened from this tragedy but understand that His plan is so much greater than our own. As you said, lets take an extra moment to give our loved ones an extra hug today. I receive a daily email called the "Covenant Newswire" and this was one of the headline stories this morning.....I thought of you. So sorry for the loss, and I hope you're feeling more hopeful today.